When it comes to movie franchises based on beloved 1980s toy lines, Michael Bay’s Transformers movies are the clear champions, having earned over $3 billion worldwide over the course of the four films. But while G.I. Joe got just as much playtime in my house as Optimus Prime and his buddies, the Joe films haven’t been nearly the box office monsters as their transforming buddies. The first Joe movie, which holds the distinction of being nearly as bad as the worst of Transformers, earned $302 million, and the much-improved G.I. Joe: Retaliation pulled in $375 million. Maybe all the Joes need to take things to the next level is a team-up…say, with a bunch of giant robots who can turn into cars. It might sound far-fetched, but producer Lorenzo di Bonaventura isn’t ruling out the possibility. I don’t think they’ve run out of stories yet. I think later on that’s a possibility, but I don’t think in the near future at all. It’s not something we’ve talked about either, because there’s a lot more story to be told in both cases. I think if, at some moment, we all think, you know what, it’s time to bring the two of them together, we’ll do that. But I think they’re strong enough to exist on their own. I don’t know necessarily why, but I just think there’s so much that’s so rich in the mythologies that I don’t think they need to draw from the other. I think, I didn’t rule it out for me and I think those things have somehow for me, sort of in the past, they made me feel like a little bit cynical exercises in just drawing money out of something. It’s not to say you couldn’t do it well, but both these properties have such rich mythologies with so many characters, that you could go a lot of movies before you start running out of ideas of what to do. But it’s not to say, if we found the right… I’d hate to set out to do that, but if I heard a story where we went, ‘Oh my God…,’ I could see a story right now about machination, machination of war and that could lead you sort of intrinsically to a Transformer. Now, if you aren’t a kid of the ’80s and have never really followed the Transformers/G.I. Joe comics, you might be wondering where the hell the idea of those two properties might have come from in the first place. But much like Aliens and Predator, the Joes and the Transformers have been teaming up and facing off in supplemental media for decades now. Marvel published a four-part G.I. 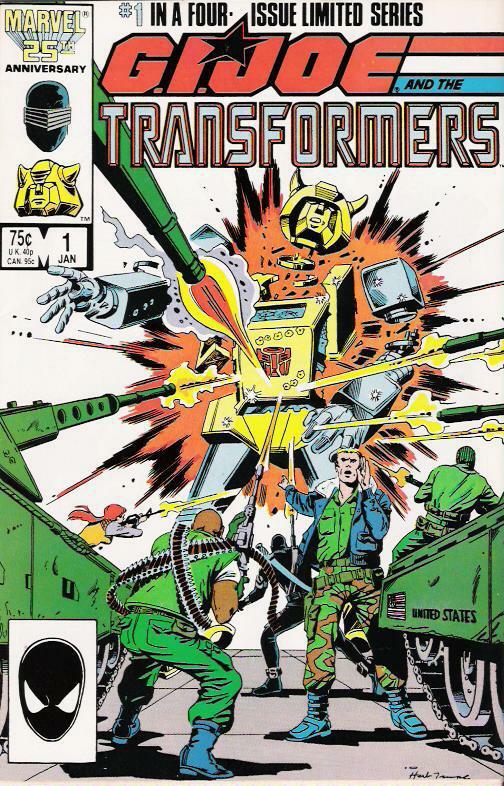 Joe and the Transformers mini-series back in 1986, and the worlds of the two franchises have continued colliding throughout the various iterations of their respective comic lines over the years. So while there’s no telling whether a movie crossover will ever happen, there’s certainly precedent. If so, hopefully it’ll turn out better than the Alien vs. Predator movies. The crossover idea also isn’t as far fetched as it might first sound. Both movie franchises are based on Hasbro toy lines, produced by di Bonaventura, and distributed in part by Paramount. There would theoretically be a lot less red tape involved in a Joe/Transformers crossover movie than, say, trying to get Andrew Garfield’s Spider-Man into Avengers 3, since those franchises are held by different studios. But it also makes sense when you consider what’s happening on the larger pop culture landscape right now. After the massive success of the Marvel Cinematic Universe, pretty much every studio out there is looking to their own IP catalog to try and come up with their own “cinematic universes.” Sony is stretching its Spider-Man universe thin by greenlighting Venom and Sinister Six spin-offs, in addition to any future Spider-Man sequels. Universal is trying to revive their classic monsters — Dracula, the Wolfman, Frankenstein’s monster, and the like — into a shared movie universe. Even Star Wars, which has long been a massive multimedia empire, has streamlined its continuity and is being much more deliberate about what counts as “canon” as we head toward Episode VII in 2015. An Avengers-style Transformers/G.I. Joe crossover makes perfect sense from that standpoint, and since both franchises are straight-up over-the-top action franchises, it wouldn’t take much to make the characters feel natural within each other’s worlds. Will it ever happen? Who knows. But it sure wouldn’t surprise me.